Are you looking for something different to do this summer, then why not come along to a new course by experienced lecturer Dr Geoff Doel from the University of Kent. At the time of posting, places were still available. Dates: Tuesday 29 May 2018 to Tuesday 19 June 2018 (4 weeks). Time: 14.30 to 16.30 at the Camden Centre, Tunbridge Wells. Course Tutor: Dr Geoff Doel is Associate Lecturer at the University of Kent. Course Aim: To discuss three women writers who influenced Jane Austen; Ann Radcliffe, Fanny Burney and Maria Edgeworth. The course will finish with Northanger Abbey, which includes Jane’s views on the novel and a friendly send-up of her literary sisters. 29 May – A Sicilian Romance by Ann Radcliffe. The plot concerns the fallen nobility of the house of Mazzini on Sicily. 5 June – Camilla by Fanny Burney. Jane subscribed to this novel and it is partly set in Tunbridge Wells. Course Cost: £35.00 for 4 sessions or £10 for each session. It may be free if you receive income-related benefits. Includes free refreshments. 3. By post & enclose cheque payable to WEA Tunbridge Wells. Send to Jane Urquhart, Gyll Cottage, Vale Road, Mayfield TN20 6BB. About the WEA: The lecture is organised by the Tunbridge Wells branch of the WEA , a non-political and non-profit making charity that organises educational courses and lectures. Any event money, after paying the lecturer and venue hire, goes directly back to central WEA and pays for education to those let fortunate than ourselves. *Note on the artist: Elaine is taking part in the Tunbridge Wells’ Artists Open Studio, 2nd to 10th June, 10 am to 6 pm, at 4 East Cliff Road, Tunbridge Wells, Kent, TN4 9PL. 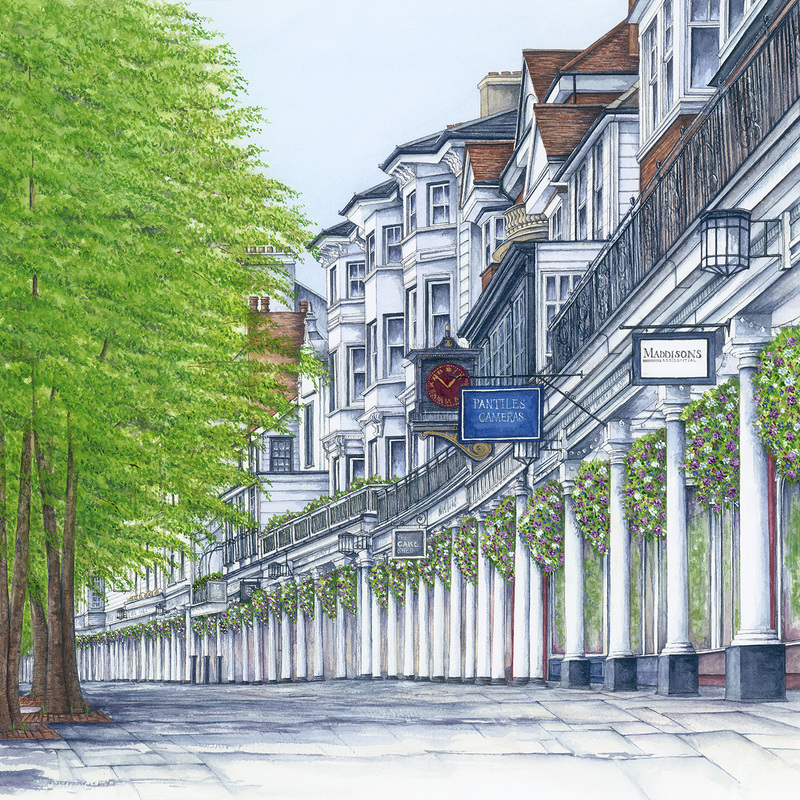 If you would like a copy of the Pantiles picture, please visit.